Six different islands, six different experiences. Hawaii Island is the youngest and largest island in the Hawaiian chain, but it’s remarkable for more than just its size. 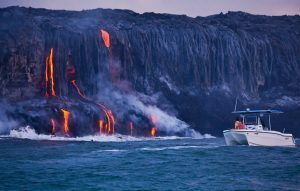 Here you can visit one of the most active volcanoes in the world, or walk on a black sand beach, snorkel with manta rays, horseback ride in Waimea or sail along the Kona Coast. It will be difficult to focus on your swing and not the pristine, black lava-lined fairways and palm tree-speckled greens, surrounded by crystal blue waters just beyond the bunker. With some of Hawaii’s most magnificent courses to choose from, some crafted by the biggest names in course design, Hawaii Island is known as the “Golf Capital of Hawaii.” Discover courses along the Kohala Coast, such as the Jack Nicklaus designed Hualalai Golf Course, the championship Francis H. Ii Brown courses of the Mauna Lani Resort and the Robert Trent Jones Sr. designed courses at Mauna Kea Resort. Not to be outdone, play the two courses of the Waikoloa Beach Resort designed by Robert Trent Jones, Jr.
Mauna Lani Resort Francis H. I’i Brown South Course was home to the original Senior Skins Game from 1990 to 2000 and is the first course to play before tackling the more prodigious North Course. Another reason to play is No. 15: a stupendous, ocean-drenched par-3, and Hawaii’s most photographed over-the-water golf hole. However, if there is more than just a breeze, its timeless beauty can turn to treachery. South delivers an extremely playable and forgiving layout with ample fairways and approachable greens. But the illusion created by black lava on both sides of virtually every hole a Big Island golf staple makes the playing areas seem rather tight. Mauna Lani fittingly means ‘mountain reaching heaven,’ its name coming from Mauna Kea to the north and Mauna Loa to the south. Mauna Lani Resort Francis H. I’i Brown – North Course is a feast of lush fairways and inviting greens set atop an ancient lava flow much older than the South Course’s Kanika flow. The challenge here is to keep the ball in the short grass and avoid the array of kiawe trees that populate nearly every hole. If you don’t, you’ll soon find out why the North course is rated slightly tougher than the South. The most distinctive hole on the North course is the short par-3 at No. 17. It plays from an elevated tee to a wide green that sits down inside a bowl of threatening lava rock. Be aware of the ever-present and changing wind. The large bunker that fronts this inviting green is there for good reason. Mauna Kea Golf Course When the Mauna Kea Golf Course opened in December 1964, it was quickly recognized as the grand dame of all Hawaii golf courses’ title she will likely never surrender. Its classic elevated greens combine with the prevailing trade winds to put a high value on approach shots that must sit gently and accurately on hearty, often pitched greens. The famous, par-3 signature third hole requires significant water carry along a dramatic rocky shoreline where nooks and crannies host the surging Pacific as well as hundreds of lost golf balls. Many classic holes are found throughout this enviable layout and Mauna Kea remains a can’t miss golf experience for all golfers visiting Hawaii’s Big Island. Hapuna Golf Course is Arnold Palmer and Ed Seay designed, featuring a links-style course routeing, where Palmer and Seay manage to reveal each hole incrementally, as if it were a sumptuous 18-course meal. Throughout the course, the rolling bluff-like terrain is highlighted and defined by silky fescue grasses thriving beyond the roughs. Hapuna has also received many well-deserved accolades for its enlightened and environmentally sensitive design. Waikoloa Beach Resort – Beach Course is one of the most playable and enjoyable Big Island golf experiences. At almost 6,600 yards from the tips and 5,100 yards from the forward tees, the Beach Course is a must play for golfers of all abilities. This course is a place where you may even threaten your lifetime-best score. 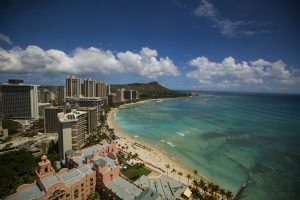 You can also add Hawaii’s second largest petroglyph field, ancient burial grounds, and the remains of an ancient fishing village to your Beach Course experience. No other course blends a tapestry of emerald green fairways, chocolate lava beds, and sparkling ocean surf quite like the Waikoloa Beach Course. Waikoloa Beach Resort – Kings’ Course While the Beach Course is certainly fun to play, the Kings’ Course presents certain challenges. Kings’ is built to play with the prevailing trade winds in mind. 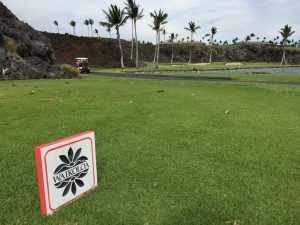 Catch this course on a day when opposite (Kona) winds are blowing, and you’ll be treated to 10 holes that play shorter than indicated, while the remaining eight will play very long indeed. And don’t be surprised if you encounter a small herd of goats prancing across the course. After all, this is the Big Island, where country is king. The Koolau Mountains tower in your sightline. Palm trees line the green. The white of your golf ball pops against the deep blue sky. Even a bad game of golf on Oahu is still pretty darn good. With more golf courses than any other island, golfers of every skill level from around the world head to Oahu. Choose from 40 public and private courses, ranging from casual municipal links to elegant resort courses. Spectacular scenery awaits you no matter which course you choose. If you prefer to watch the pros play, Oahu hosts the PGA TOUR’s Sony Open at the Waialae Country Club every January. On the island of Oahu, learn to ride the waves in Waikiki where surfing was born or catch a big-wave surf comp on Oahu’s famed North Shore. Between sunrise and sunset, you’ll have hours to explore the hottest farm to table restaurants, browse the latest designer and local fashions, check out the urban art scene or stroll into Hawaii’s history at Iolani Palace. When the sun sets, it is imperative that you are relaxing, facing the ocean with a Mai Tai at hand with the gentle sounds of ukulele reminding you that there’s no place quite like Hawaii. Ko Olina Golf Club has hosted both Senior PGA Tour and LPGA Tour events, with its prevailing trade winds its strongest characteristic and biggest challenge. A real stunner appears at No 8, a par-3 with cascading rock garden waterfall left of a multi-tiered green. Ko Olina’s finishing hole is an engaging par-4. The tee shot is critical to determine the length and position in which to approach the slightly elevated green protected at front and left by a large pond and waterfall. Hidden at the dogleg is still another water feature that comes in from the right. Getting on the green is only half the battle on this tiered putting surface. Turtle Bay Resort – Arnold Palmer Course is home to both Champions and LPGA Tour events, that offers a superb layout that winds around a 100-acre wildlife preserve in the serene Punahoolapa Marsh. After playing across and into the prevailing wind for the first five holes, the front nine turns downwind at the enticingly short par-4 dogleg right sixth. The exquisite par-4 at No. 16 is one of Hawaii’s best and the exceptionally creative 18 completes a string of marvellous finishing holes. Turtle Bay Resort – George Fazio Course is a playable resort course for golfers of all abilities, and a much more forgiving layout compared to the resort’s newer Arnold Palmer Course. The relaxing ambiance of the Fazio layout can be described as downright soothing. Wide, tree-lined fairways move you to greens graced by swaying palm trees. Even though much less difficult than its sister layout, Fazio’s only Hawaii golf design features plenty of wind, primarily due to its beautiful location along Oahu’s North Shore. Most will take a short pause before teeing off on the par-5 No. 7 to see the crashing surf on the white sand beach peeking through the seaside stand of Norfolk pine. Known as the “Valley Isle,” Maui is dotted with quaint towns, artist communities and local favourites that have been around for generations. Choose from 14 courses (several of which are ranked at or near the top of the “world’s best” lists) designed by noted course architects and golfing luminaries such as Arnold Palmer and Ben Crenshaw. You’ll see why it’s difficult to imagine a more dramatic setting for these 18-hole masterpieces, with fairways abutting ancient lava flows, tees surrounded by palm groves, and greens arched by rainbows formed in the ocean mist. From Kapalua to Wailea, the views are intoxicating. But stay focused on your game. You’ll want to show off that Maui scorecard when you return home. Kapalua – Plantation Course delivers a dramatic landscape unlike any other Hawaii golf course. 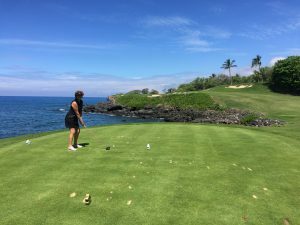 Perched along the northwest-facing seaside slopes of the West Maui mountains, golfers can choose to focus on either the commanding westward views of the islands of Molokai and Lanai or the incredible shot-making required to record a good score. Most will find it difficult to do both. The drama and scale presents immediately at the opening hole, a massive par-4, 520 yards from the tips that normally plays downwind. By the time golfers reach the 4-par 17th and 5-par 18th holes, both of which invite sweeping approaches from the right of the green, it’s the wind that’s decided whether your round was played airborne or atop the auld sod. Kapalua – Bay Course is the older of the two current Kapalua Resort courses and offers a striking contrast to the sweeping vistas and constantly changing elevations of the nearby Kapalua Plantation Course. Designed by Arnold Palmer and Francis Duane and opened in 1975, the Bay Course typifies what many golfers expect to find in a Hawaii golf experience. Two seaside holes are found at No. 4 and 5. The 5th hole, an inspiring cliffside par-3, defines the name ‘Kapalua,’ or ‘arms embracing the sea,’ as it caresses a small inlet of crashing surf. The 16th hole, with a carry over a pond to a crafty split fairway, is one of Hawaii’s best par-4s. Many of the other 15 holes offer pleasing views of the ocean and Molokai just across the Pailolo Channel and the surrounding collection of condominiums are hardly noticed, a compliment to the inherent beauty of this course. Wailea Resort – Gold Course is among the elite courses in Hawaii golf. With three stunning layouts at Wailea, the Gold Course’s 18 holes are the most challenging. Robert Trent Jones II’s masterful design is accentuated by the course’s rugged topography. Jones’ thoughtful design includes anywhere from four to six tee areas on each hole, making the course playable by golfers of all abilities. The natural undulations provide subtle changes in elevation. Strategically located bunkers, nearby hazards, and tree lines put the emphasis more on accuracy than length. Wailea Resort – Emerald Course Wide landing areas and receptive greens make the Emerald Course a joy to play. This underscores its reputation as the most playable of Wailea’s three fine courses. This layout presents sweeping views within a palette of natural surroundings, bursting with exotic blossoms and lush landscaping. Among the exotic flora are allamanda, bird of paradise, wiliwili, plumeria, and morning glory. 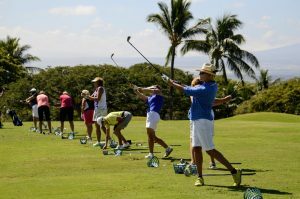 This Maui golf course has also been recognized as one of the most female-friendly courses in the world. Find the golf course of your dreams on Kauai. From Princeville to Poipu, Kauai is home to some of the world’s best golf. Visitors can play beautiful resort courses or affordable independent courses, where the rough is lined with lava rocks while mountain ranges and seascapes frame the greens. There are 10 golf courses at seven venues on Kauai. Princeville on the North Shore offers two challenging options with an 18-hole and a 27-hole course. PGA legend Jack Nicklaus and Robert Trent Jones, Jr. also designed signature courses in this resort area. You may even see some PGA touring pros out on the greens during on your visit. After all, even they dream about Kauai, too. Makai Golf Club at Princeville is a distinctive 18 hole layout comprised of the former Ocean and Lakes nines. All 18 holes were re-turfed and renovated (using the same design) in 2010. Sitting on a rolling plateau high above the Pacific Ocean and beautiful Hanalei Bay, Makai was the first resort course on Kauai. This Kauai golf setting is majestic, surreal and stunning. Every golfer has their own pick for best nine. The signature hole is the par-3 at No. 3, overlooking the serene waters of Hanalei Bay and featuring an elevated tee to a water-protected green, 100 feet below. Another scenic challenge appears at the par-3 cliff-side 7th hole, featuring a blind carry over the crashing surf below from both the middle and back tees. Prince Golf Course at Princeville at Hanalei is a magnificent Hawaii golf layout set amid 390 acres of fascinating tableland above Kauai’s north shoreline. Robert Trent Jones Jr. harnessed all of the natural elements provided him: deep ravines, tropical jungle, streams, even a waterfall. Not only is this Kauai golf course something to behold, the entire facility is impressive, including a substantial practice area and a 60,000-square-feet clubhouse. The signature seventh hole is a par-3 overlooking the surf breaking on the reef off Anini Beach, 165-feet below. Poipu Bay Golf Course, famous for hosting the PGA of America’s Grand Slam of Golf from 1994 to 2006, is spread out over 210 acres of gently rolling land perched on Kauai’s south coast. This beautiful Kauai golf course sits between rolling ocean surf and stunning mountain vistas. Particularly striking is the distant rock formation known as Mahualepu, which appears to be a relaxing giant Hawaiian god, totally submerged except for his pointy nose.